Today is the big day. ESPN will be showing the final table Live on Pay Per View. If you are trying to find a TV listing for it on ESPN, don't bother. I just went over to their TV listings and they show it playing on ESPN Deportes, which I'm sure it is, but what else? The "2004 World Series of Poker presented by Miller High Life!" will be playing on ESPN Classic. DON'T WORRY. If you are trying to order the Pay Per View for $24.95, it's on the lower left of the homepage under "Must Read". Or, you can click through this link right here! 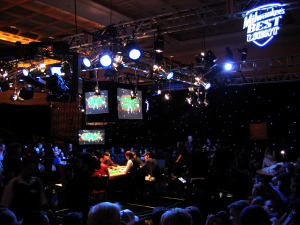 ESPN PAY PER VIEW OF THE FINAL TABLE OF THE WSOP. And you don't need a TV either, see Jamie Gold and Allen Cunningham battle for the $12 million on your PC computer! No, No, No. Amy and I really wanted Cyndy Violette to get another bracelet. The healthiest poker pro busted out third to bring home $102,648. Now it's heads up between Sean Sheikhan and Benjamin Lin. When they started, Lin was way up with $700k in chips, while the Sheik only had $220k. What's cool is that you know she's going to give us the scoop on her 2006 WSOP diary. Knowing it was going to be a late night, I planned on coming to the Rio a bit later in the day. It worked out perfectly. Today was a busy day, and now we're down to the goodies. There are three events still going tonight with the $5k Short Handed posing to be the most interesting. Right now they're on a dinner break, but it's going to be a hot late night here in the Amazon room. Here's are the top chipleaders before the break, but they still have 41 players left. Tony G, Scotty Nguyen, John Juanda, and Phil Hellmuth are right on their heels. Kenna James - Watch out for The Cowboy! Vanessa Rousso - The Lady Maverick law student is one of the top 20 female $$ earners in poker. Jennifer Tilly - Here to prove she can win with the men too! She skips the Oscars for poker, don't think she doesn't! 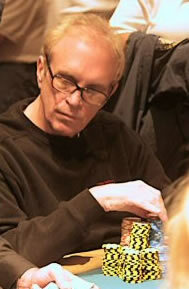 Tom Franklin - Capn Tom makes another final table! J.C. Tran - He's not new to winning final tables. Nope. With all these top shelf contenders, who are we going to cheer for? I don't know. Possibly Kenna, just because of his hat. Just when we thought it would never end, the chips changed hands yet again. The two tired men had been seeing most of the flops and the one that paired the board usually carried through. But on a flop of 9s3d8d, Chip moved all in. Andy got up and thought about it. Andy turned over 9c7s for top pair. Chip turned over Kd6d for the flush draw. the turn was the 5d, and the river, a moot Kc. It left Andy with 300k. He said, "We're not done yet," and battled it out for a bit longer, to no avail. The level ended before he did, and Andy said, "If I double up, then we can take a break." But he had no intentions of giving up. More all ins. Some calls, some folds, some wins. On the last hand, Chip went all in and Andy called. The flop came 7s7cJc. The turn was 4h and the river 4s. Andy was stunned, and Chip turned around to hug his kids. Andy's girlfriend Jen understandably left in tears while Andy was still in his interview. The two pros seemed to at least start practicing saying the words, "All In." But any hopes of this grueling match to come to an end was shortlived. First, Andy was in the small blind when they decided to face off. Andy had KsJs vs Chip's As10d. 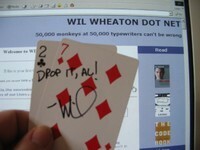 The turn was the Ace of diamonds. The river was Ace of hearts. In the next big play, Chip was in the small blind. He called and Andy raised it 150k. Chip called All In. Andy stood up. Stretched his arms, and called, showing a pair of nines. Chip turned his Kings over. The sleepy crowd started begging for a 9 to hit the board. The flop was Js2d7h. Groan. The turn was Qc. Ouch. The river was the Ad. Chip's fighting chips doubled him up again. It has now been heads up for a little more than five hours. The players are finishing up a break. There was a little ALL IN action from Chip before the break, but no call from Andy. The Full Tilt Pro is cheerful and in good spirits, while Chip looks a bit tired. He seems to have family in the stands cheering him on. In the 43rd hand of heads-up play at the 2006 WSOP HORSE final table, we got a little something-something to amuse the poker bloggers. Andy Bloch was on the button and in the small blind. He raised 75k, and Chip Reese called. Andy laughs to himself, his hands on his hips. Andy is ahead with a pair of sevens. The count is now, Chip Reese $9mil, Andy Bloch $4.3 mil. I made it. It's 1:45am. I owe Pauly and BJ Nemeth for calling me at the right time to get me over to the Rio for the final final. There was no telling how late or long this event would go when it started at 9pm yesterday. So, my strategy was to sleep a bit and then come down for the last half. But the guys let me know when the action was going fast. And boy was it. BJ called at 6, Pauly called at 5, and by the time I got here we were down to three. Sadly, Doyle isn't one of the remaining players. Here's who is left. Catch up on the full story at PokerWire, Tao of Poker, and Blonde Poker. But no sooner had play resumed when there's a defining moment. 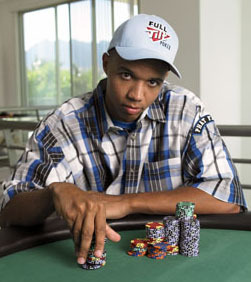 Andy checks, Phil bets 100k, Andy raises 400k -- Phil Ivey announces he's ALL IN. The Turn is the Ace of diamonds. The audience is cheering for Phil, "One Time!" The River is a 6 of clubs. Here is the rest of the payouts.